Celebrating the release of their new book, “The Dirtbag’s Guide to Life,” Boldly Went is hosting "Tacoma is for Dirtbags," a night of YOUR stories about why Tacoma is a rad place to live if you love the outdoors. "The Dirtbag's Guide to Life" is a celebration of an underappreciated subculture of hiker trash, ski bums, and vagabonds, and a "how to" guide for a life of adventure on the cheap. It was written primarily in Tacoma, shortly after we decided to move here because we were so inspired by the city's outdoor community, and the city's spirit soaked deeply into the book. Tim Mathis, the author, will introduce the book, will talk about how Tacoma factored in to the writing. and will make his case that Tacoma is the best city in the US to be a dirtbag. Then, YOU will be invited (if you so choose) to tell 10 minute or less true stories involving Tacoma, the outdoors and adventure. If you're familiar with Boldly Went events, the format will be similar, with the twist that all stories have to involve Tacoma - whether it's about the way the running community inspired you to complete your first ultra, or the time you biked from downtown to Paradise and summitted Rainier, or the time you flipped your boat on a paddle to Vashon, this is a chance to share Tacoma outdoors love. Stories will be recorded for the Boldly Went Podcast, to share the Tacoma stoke with the wider outdoor world. Books will be available for signing and sale at the lowest price you'll find anywhere. 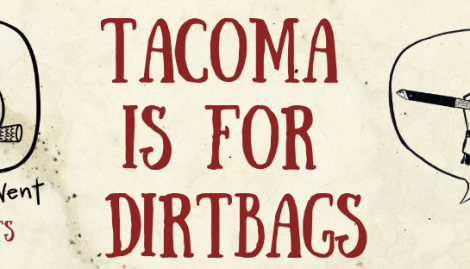 After all, Tacoma is for dirtbags! And if you know what's what, you can also buy limited edition handmade copies, made from junk we found around our house, with your ticket purchase! Quantity is limited so sign up soon if you want one! Nope! This is an all ages event and your little dirtbag is highly encouraged to take the stage! All outdoor adventures (as long as Tacoma is somehow involved)! Phone: 206-790-8625, email timothy_mathis@yahoo.com, or just message us on FB!